Two years ago today, I saw Clay live for the very first time. I had wanted to get tickets- because I never saw the AI2 tour. I had tried for weeks and weeks- the venue was Nassau Coliseum on Long Island. The week before the show, I was walking the dog, and I saw a shooting star- DONT LAUGH!! so I wished that I could get tickets. THE VERY NEXT DAY I tried and got two tickets for my sister and I. Its a hockey arena normally, and we were on the 1st row up from what would have been the "ice"
I told my sister that I heard Clay would come out through the audience- a lot of people had gathered at the entrance across the way, but when I saw Jerome, I said " I BET he is coming out here!!" Then, after the intermission, after I had bought my first CLAY program, the lights dimmed. AND I WAS HOOKED- no going back for me. I was a FANGIRLY, for crying out loud!! Clay did not feel well that night- he had appeared on THE VIEW that morning and was fighting a cold. At the show that night, a member of the audience gave him cough drops. 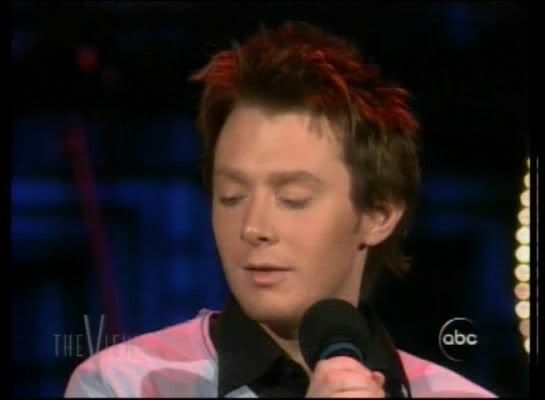 But he did the whole show, and only broke up a little on "Open Arms"
Here is a picture of how he looked on the view that day! Did anyone else on the board attend that show? I AM A FANGIRL TOO-& I AM LOVING IT!!!! What great memories... Thanks for sharing them with us.. I have those same feelings from my first Clay concert... Hubby was sitting next to me and Clay was coming down our isle... I couldn't believe I was going to see him up that close.. I remember my husband pushing me in Clay's direction so I could get close to him... I nearly fell on top of a few people in my way.. What a good hubby he is... He know's how important Clay is to me... Now I do my concert treking with my Clay friends.. Much cheaper and he doesn't have to see me drool.. Thank you for reminding us all how special yesterday was. I just watched the Wild Card show the other night and I remember it vividly. I remember when Clay got sent home initially how depressed I was and then on the wild card the relief that I'd get to see more of him. Sigh.... I just wub Clay! Powered by SMF 2.0 RC3 | SMF © 2006–2010, Simple Machines LLC Page created in 0.043 seconds with 23 queries.